A cruise ship that was making its way to Cuba was not allowed to dock in the country when it arrived. A cruise ship that was headed for Havana, Cuba on Friday was denied entry to the country. Now, customers are upset and travel organizers are working to figure out why they couldn’t get into Cuba. “We didn’t pay to sit in international waters, we paid to go to Cuba, to Havana!” said one passenger yelling inside a theater on the ship. Bahamas Paradise’s cruise ship, the Grand Classica, departed the Port of Palm Beach Thursday for her maiden voyage to Cuba. The ship would have arrived in Havana on 7 a.m. Friday. Some people would have gotten off the ship to explore the island, and some Cuban nationals would have been allowed to temporarily board to reunite with family and friends. Wynter’s mother left Cuba in 1972. This would have been her first time back. 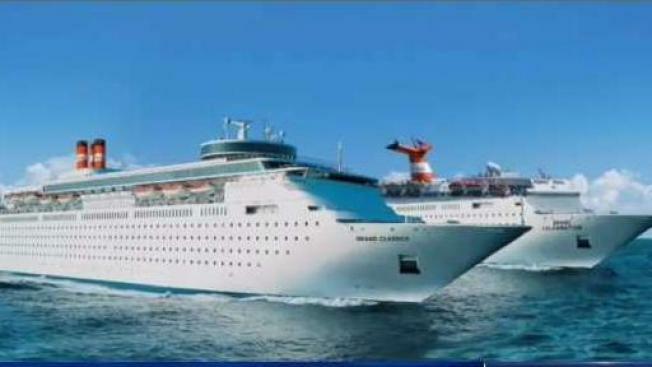 A spokesperson for Bahamas Parade Cruises said that Viva Travels, a travel agency, chartered the Grand Classica. The spokesperson said that despite prior approval from the Cuban government, they were denied entry for unknown reasons. The ship left Cuba and made its way to the Bahamas. The ship is set to return to West Palm Beach on Monday. “There’s no activities, there’s no performances, there’s really nothing to do,” said Wynter. WPTV said that a call to the Cuban embassy in Washington DC was not returned.